Fun. Smart. Affordable. 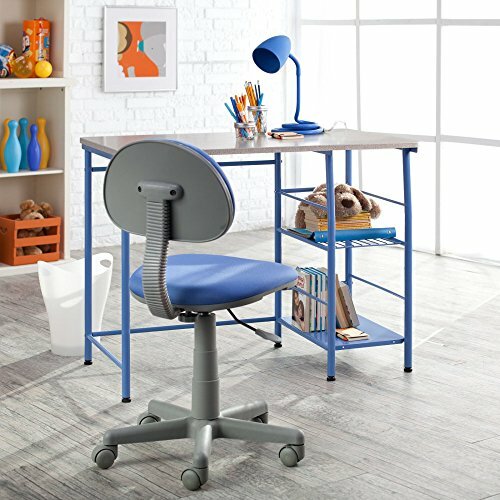 The Study Zone II Desk & Chair - Blue makes a perfect desk set for children of all ages or for adults who want a compact home office. Its sleek design and sophisticated finish ensure that it fits small spaces and most any decor. Its large work surface and two large side storage shelves provide plenty of room for binders, CPUs, books, and more. Complete with an ergonomic chair that features superior lumbar support, adjustable height settings, and caster wheels that roll easily. Dimensions: 39.25W x 24D x 29H in.. 2 side shelves measuring 11.5W x 17.5D in.. Laminated wood desk with blue metal frameErgonomic chair design for superior lumbar support. Chair adjusts in height from 18 to 21 in.. Recommended for ages 12 years and older. Dimensions: 39.25W x 24D x 29H in. 2 side shelves measuring 11.5W x 17.5D in. Chair adjusts in height from 18 to 21 in.